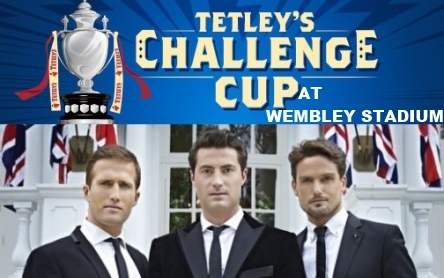 The trio promise a 90,000 strong singalong at the Wembley Challenge Cup Final this weekend. They headline the pre-match entertainment at this year’s Tetley’s Challenge Cup final between Hull FC v Wigan Warriors at Wembley Stadium on Saturday August 24. Prior to kick-off at 3.00pm, BLAKE, who have sold over a million albums worldwide and performed on over 150 television programmes across the globe, will lead the crowd with their Brit Award winning rendition of the traditional Challenge Cup anthem, ‘Abide With Me’ before leading the 90,000 strong crowd in a rendition of the national anthem, ‘God Save The Queen’. The pre-match entertainment will also include a set from the Royal Imperial Military Band and Blake will be joined by up-and-coming soprano Natalie Coyle for God Save The Queen. In October Blake will return from a tour of Asia for the autumn leg of their UK ‘Live In Concert’ tour on which they will be joined by special guest Camilla Kerslake. Having first worked with Camilla when they performed Nessun Dorma together at the 2010 Classical BRIT Awards, Blake have invited her to join them as their special guest on their ‘Live In Concert’ tour. Together Blake and Camilla will be performing their new single ‘You Raise Me Up’ which has been recorded in aid of the Breast Cancer Campaign, a charity that is close to Camilla’s heart and for whom she is an ambassador. Absolutely amazing opening ceremony , beautiful voices ! !